Around Lake Mutirikwi, in southern Zimbabwe, the politics of rain making illustrates how water can index the contested play of sovereignty and legitimacy in ongoing reconfigurations of rule over landscape. A similar argument can be made for other, more technocratic regimes related to water. For example, continuing official insistence upon the prevention of soil erosion and dam siltation too involves performances of sovereignty alongside more productive mechanisms of power shaping political subjectivities and regimented landscapes amid appeals to developmentalism and governmental legitimacy. Such regimes exist in close proximity to and intertwine with the politics of rain and the ritual protection of sacred places as so-called traditionalist and technocratic registers of meaning and rule entangle across levels. Chiefs, mediums, war veterans, new farmers and others can all be simultaneously involved in rain making and technocratic soil conservation without contradiction, because all gain traction through the material potentialities of water and land. The significance of soil conservation strategies for understanding the political materialities of land and water in Zimbabwean state-making, and the entanglement of multiple regimes of rule and registers of meaning through the active remnants of past landscape interventions, is hard to exaggerate. It reappears repeatedly in the literature. Here, however, I focus on two particular concerns to do with water that were salient around Lake Mutirikwi in 2005/6, when fieldwork was carried out: local demands for access to fishing and for irrigation from the lake’s waters. 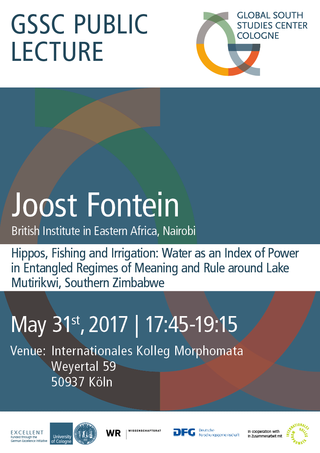 I argue that it is dangerous encounters with njuzu water spirits, hippos and crocodiles, threatening fishermen and farmers, that best illustrate the complexity of sovereignties, legitimacies and subjectivities involved in water’s role as an index of power across coexistent, entangled regimes of rule and meaning. The ambivalent significance of hippos in particular - as materialisations of njuzu for some, as totemic taboos for others, or as protected but hugely destructive wildlife – points to the indeterminacies of meaning and rule in complex, emergent assemblages of people, spirits, animals, things, water and landscape.